How to fix "Setup ended prematurely because of an error and the system has not been modified" error during installation. How can I login into my LEAPWORK account? How to access Unstable/Experimental versions of LEAPWORK? How to Download and/or Upgrade LEAPWORK? How to Force an MSI Package to Install Using Administrator Mode? With the LEAPWORK Automation Platform, users at all business levels can build Web, Desktop, and Virtual Desktop automation in minutes. Cases are designed as flowcharts and automated without writing a single line of code. This means your organization can set up and run automation without having to learn a new skill set or rely on external consultants. The LEAPWORK Automation Platform consists of three components: Studio (the designer), Controller (the server) and Agent (the runner). LEAPWORK Studio is a desktop application made for Microsoft Windows. It’s a powerful, visual designer that can be used by anyone in your organization to easily create automation cases, setup schedules to run automation cases on physical or virtual machines and in the cloud, and dig into the results with dashboards and reports. The Controller is a service that runs in the background, and it’s also made for Microsoft Windows. It hosts and stores all automation assets such as cases, images, schedules, reports and so on. It also controls how automation cases are run and on which environments. The Agent is also a service that runs in the background on Microsoft Windows as well as Apple MacOS / OS X. It is the runtime agent that takes care of executing the individual automation cases one at a time, when requested by either a Studio or Controller. For more information about how to use LEAPWORK, please explore our Learning Center. Studio communicates with the Controller using a REST API. The REST API is hosted on the Controller and can also be used by external scripts and integration mechanisms. 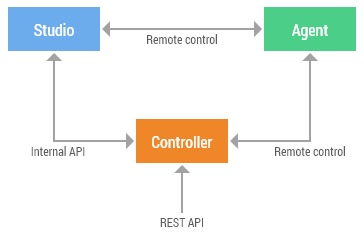 The Controller communicates with connected Agents using an internal remote control protocol that is similar to VNC, with some added control mechanisms. Studio can also communicate directly with an Agent using the internal remote control protocol, when designing and preview-running automation cases. It’s important to note that all three components (Studio, Controller and Agent) can be installed on physical and virtual machines in protected networks behind firewalls and without internet access. Multiple examples of how to use the REST API to integrate LEAPWORK with ALM systems such as HP Quality Center, JIRA, Jenkins and more can be found in the Learning Center. In this setup, the user can use LEAPWORK as distributed testing environment. The user can trigger tests on remote machines without getting disturbed. Distributed testing enables the user to run tests in parallel thereby reducing test execution time. Distributed testing through LEAPWORK lets the user setup parallel test case execution on different browsers/platforms, allowing the test case results to be aggregated by the LEAPWORK Controller. Please follow installation instructions per component mentioned below, and install one component per machine at a time. It is recommended to install one agent per virtual machine and have multiple agents to be able to execute test in parallel. You can install Studio and Controller on a single machine or on two different machines if needed. Note that the Controller and Agents can be installed in closed networks without internet access, such as firewalled test networks. Studio, on the other hand, does require an internet connection for license activation and error reporting. Studio is a desktop application made for Microsoft Windows 7 or later. It is a powerful, visual designer that you can use to easily create automation cases, setup run schedules and dig into the results with dashboards and reports. On local/development environment with internet access. On cloud or virtual environment with internet access. On firewalled test network with or without internet access. The image below depicts some widely used configurations for Studio. After downloading the latest appropriate version (32-bit or 64-bit), you install LEAPWORK Studio by double-clicking the downloaded MSI file. The first screen will display the version number and ensure that the downloaded version fits your computer. Click “Next” to begin the installation. Controller port.The default is port 9000, which you can change to any other port number that is not in use by other software on your computer. NOTE: Unless it is necessary for any particular reason, we do not recommend changing either the Controller, Controller API or Agent port numbers. If you have chosen to install the Automation Controller, then Controller services will automatically start on Controller machines as the installation finishes. The Controller is a service that runs in the background, and it is also made for Microsoft Windows 7 or later. It hosts all automation assets such as cases, images, schedules, reports, etc. It also controls how automation cases are run and on which environments. Studio talks to the Controller using an open REST API that you can also tap into as much as you like. Ideally, the Controller can be installed on any environment which is accessible to the Studio. Over the cloud, on the condition that the Controller API is accessible to Studio. After downloading the latest appropriate version (32-bit or 64-bit), you install the Controller by double-clicking the downloaded MSI file. The configuration screen contains several settings that you can modify before completing the installation. Controller port. Studio and the Controller always communicate using internal API calls, and this requires the use of a TCP port. The default is port 9000, which you can change to any other port number that is not in use by other software on your computer. NOTE: Unless it is necessary for any particular reason, we do not recommend changing either the Controller, Controller API or Agent port numbers. Controller API port. For any integration effort, access LEAPWORK’s open REST API using the port number set here. The default is port 9001, which you can change to any other port number that is not in use by other software on your computer. NOTE: Unless it is necessary for any particular reason, we do not recommend changing either the Controller, Controller API, or Agent port numbers. Add exceptions for the Controller in Windows Firewall. A check in this box will direct the installation process to add a rule to the Windows Firewall to permit all incoming connections to the Automation Controller. NOTE: Because the LEAPWORK Automation Platform is also often used in corporate and already secure test networks, the password is optional. In Choose password for 'admin' user screen specify a password for the default user (“Admin”). The “admin” user is used for the first login in Studio after the installation. Note, that the password you enter for the admin user is securely located in your local installation only. LEAPWORK cannot assist in retrieving this password should you forget it. Save the database encryption key, which is used to protect the database files created during the upgrade. This key is used to allow the Controller to gain access to the database files, so in case the Controller needs to be moved to a new machine or in case of a restore of the LEAPWORK system, this key is needed. Save the key in a protected and safe place. Agent is a service that will run in the background on any operating system or device that you want to run automation cases on. We call them environments. The Agent takes care of executing the automation cases on the environments and will continuously talk to the Controller using a closed remote-control protocol, updating it on the status. Note: Agent service is available on Microsoft Windows 7 SP1 or later and OS X / macOS. For Mac installation, please see next section. Over the cloud, on the condition that the Agent can communicate with Studios and the Controller without network interruption. After downloading the latest appropriate version (32-bit or 64-bit), you install LEAPWORK Studios by double-clicking the downloaded MSI file. The configuration screen contains several settings that you can modify before completing the installation. By default, the Agent talks to the Controller over port 6777. You can choose to secure it with a password if you want to. The password is left blank by default. If you have chosen to install the Automation Agent, then agent services will automatically start on the Agent machine as the installation completes. How to install the Agent on Mac?